Ants are social insects, they communicate with each other by various means. They use sound, touch, sight and especially chemical communication. Les fourmis possèdent de nombreuses glandes qui produisent, stockent et sécrètent un grand nombre de substances chimiques, dont les phéromones. Finally, ants from one colony share the same smell, which enables them to directly recognize friends and enemies. In most species, simple messages are transmitted by direct physical relationship, such as touching or patting. This type of communication is used for recruitment or during the trophallaxis. A more specific example is that of weaver ants, which vibrate their antennae on the head of the larva to produce silk. 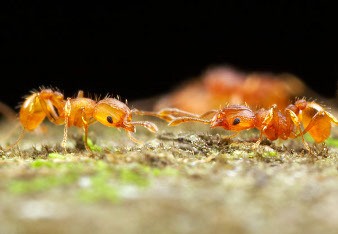 Ants produce sound by 2 ways: by tapping or stridor. It may signal fear, information on a food source or a request for reinforcements. Regarding tapping, some species of ants strike the land with their heads or their jaws to signal danger.